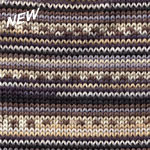 Plymouth Yarns Adriafil KnitCol is a gorgeous self-striping, supersoft 100% superwash merino yarn that is a pleasure to work with. Each change of color and pattern is a delight to both the knitter/crocheter and the wearer of the garment. 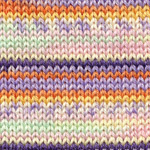 This fun patterning yarn is perfect for most dk weight garments from baby to adult as well as accesories such as socks, mitts and cowls.